When you paint a pencil line with a bitmap colour swatch, you can override the position of the texture fill using the Colour-Override module and a Peg. 1. From the Module Library view, drag a Colour-Override module and drop it in the Network view. 2. From the Module Library view, drag a Peg module and drop it in the Network view. 3. 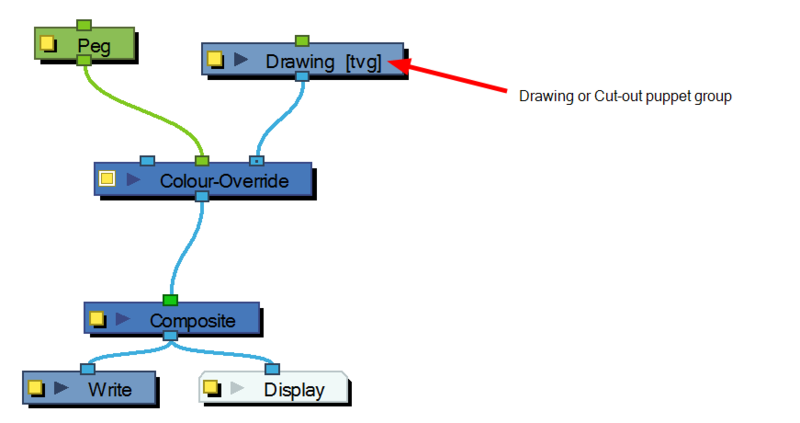 In the Network view, connect the Colour-Override module under the Drawing module you want to animate the line for. Note that for a cut-out puppet, you would connect the Colour-Override under the final Composite, set as Pass-Through. 4. Connect the Peg module in the Colour-Override's middle port. The green port will take the transformation of the Peg to modify the pencil texture's position. 5. Click on the Colour-Override's yellow button to open the editor. 6. In the Colour-Override window, in the Palettes section, select the palette containing the colour to override. 7. In the Colours section, select the bitmap texture swatch you used to paint your lines and drag it to the Colour-Override section. 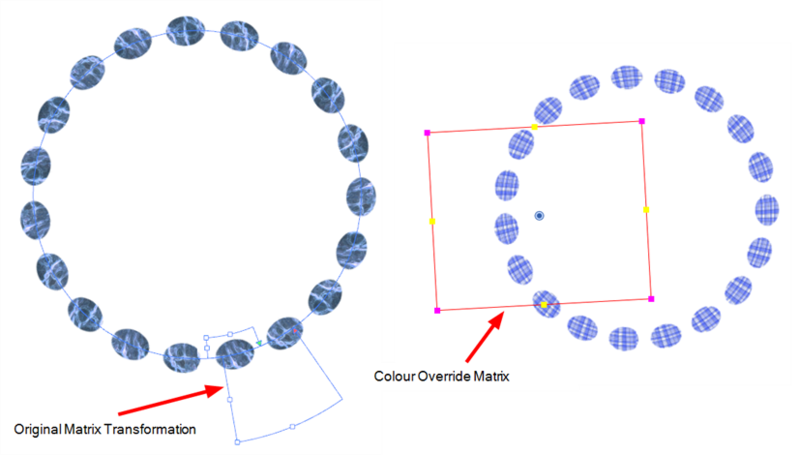 ‣ Modulate Pencil Texture Colour (replace transformation):This option will override the initial texture fill's transformation (matrix) established when you painted the line or modified it with the Edit Gradient and Texture tool. This transformation override will be done by modifying the Peg's position. ‣ Modulate Pencil Texture Colour (combine transformation):This option will combine the initial texture fill's transformation (matrix) established when you drew the line or modified it with the Edit Gradient and Texture tool with the new position transformation you will create when modifying the Peg's position. 9. In the Network view, select the Peg module. 10. In the Advanced Animation toolbar, select either the Translate , Rotate or Scale tool. 11. In the Camera view bottom toolbar, enable the Render mode. 12. In the Camera view, move the Peg's position. As you move it, you will see the texture fill getting modified. You can animate the position by adding position keyframes in the Timeline view.